The Hopis claim that all indigenous Americans -- indeed, all humanity -- were originally one tribe (Hopi, which means "Peaceful"), and that we separated upon our emergence into this world in order to follow a pre-determined migration pattern across the face of the earth. If we followed the Creator's guidance, our migrations would lead us back, in the end, to reunite at the center. But if we strayed from the path and failed to complete our journey, settling in the world's comfortable places and making them our permanent home, we would lapse back into corruption as we did in previous times and this would once again become the cause for our world's destruction. 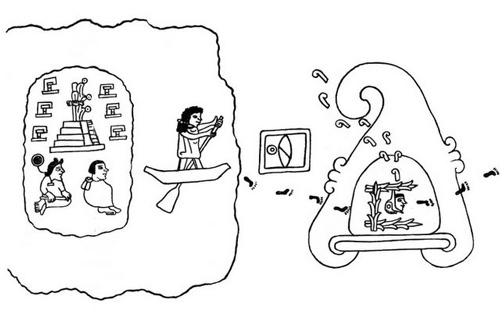 The Aztecs claimed to have emerged into this world from a place called Chicomostoc, the "[Place of the] Seven Caves." Like the Hopis, they said we passed through a series of several previous worlds before coming to this one. 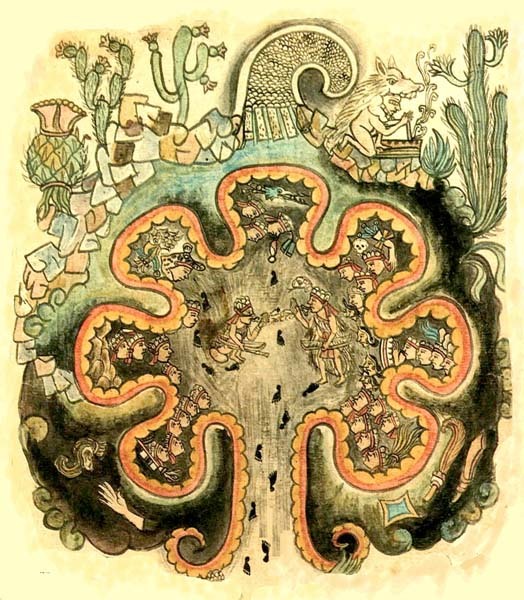 In the best-known depiction of Chicomostoc (right), it appears to be a womb-like enclosure with the Seven Caves opening onto the Place of Emergence. According to Dr. Fermin Herrera (in the article linked above), the Nahuatl (Aztec) word for "cave" is often used metaphorically to mean "womb." Grandfather Martin claims that the ancient Aztecs were a group of Hopis who traveled south on their migrations but did not move on when the time came but remained in the comfortable climate they'd found in Mexico (as they'd been warned not to do) and eventually degenerated into a state of corruption that became the spiritual cause for their destruction at the hands of the Conquistadors -- their own, personal "End of the World." It's an old story Grandfather Martin says has happened again and again throughout human history and is repeating itself today.